This new feature, added in Version 7.1.1, allows a 'Route' to be drawn on a map, and the radio performance of a specified Transmitter/Receiver pair to be evaluated as one traverses the plotted route path. The required Route is defined by Waypoints, generated by the 'Object Editor', found under 'Tools/Object Editor'. Opening the Object Editor and entering 'File/New/Lines' will produce the pane below, where the Line width and color can be specified. Every click on the map will enter a waypoint at that position, and when the required route has been completed, 'Stop Add' will finalise the route. The Route can then be saved using 'File/Save' function. (Note that the Object Editor was updated from RM Version 7.6.6 to show Altitude in metres, and to have additional Control button functions). Activation of the 'Draw' command will cause the Route to be drawn on the active picture with the Width and Color specified above. 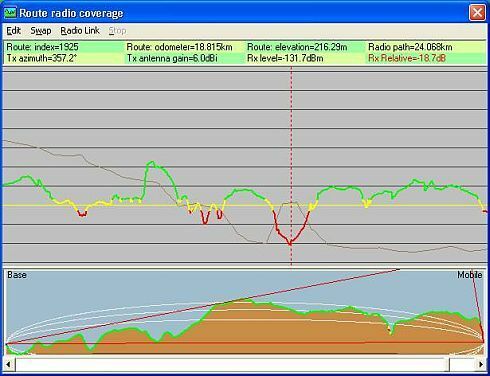 The Route Radio Coverage pane will open with the cursor at the start point of the Route. The cursor can be moved using the Left and Right arrow keys, or a left click on any point on the grey part of the Route Coverage pane will move the cursor to that location. The Route and Radio Link are shown in Green for signals at +3dB and above the receiver threshold, with Red for signals below -3dB. Signals in the +/- 3dB range being shown in Yellow. Route Elevation is shown as a Brown line in the background of the pane if selected, changing to Blue where there is a Line of Sight path between the Units. 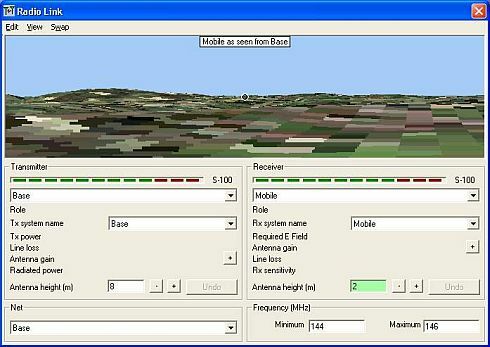 The Radio Link line also reflects the signal range colors, and the position of the 'mobile' unit is shown by the red cross wires on the main display, with its location being given at the bottom of the screen. The lower part of the pane shows the ground profile and direction of the active radio path. 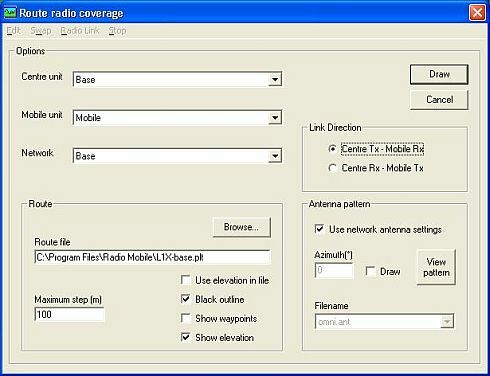 When small step increments are set using 'Edit/Options' from the Radio Coverage options pane - e.g. 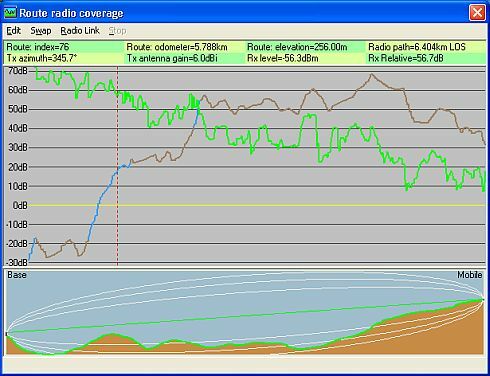 10m - a scroll bar will appear at the bottom of the Radio Coverage pane, as only a portion of the route will appear in the window. A click on the scroll button, followed by arrow action will keep the cursor on the scrolling screen. The 'Shift+click' actions still operate, and the total route radio performance can be examined by moving the scroll button. To return the expanded view to the Cursor position, 'Left click' in the top green area of the window. This pane has all the route data in the green area. 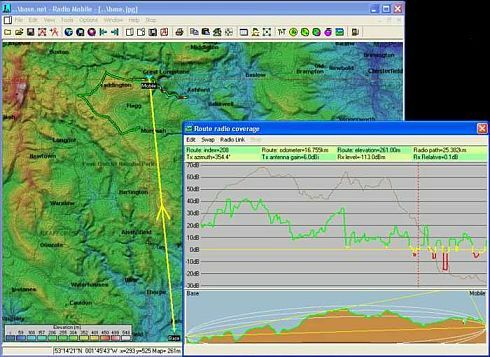 The 'Route elevation' displays the route elevation at the cursor position, the 'Route odometer' showing the linear distance along the route to where the cursor is placed. 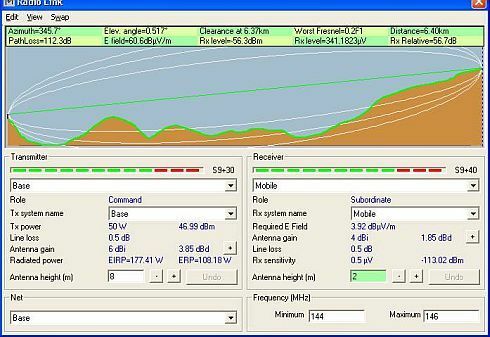 'Radio path' shows the length of the direct Radio path to the 'mobile' unit from the fixed unit, and the bearing of the Unit. 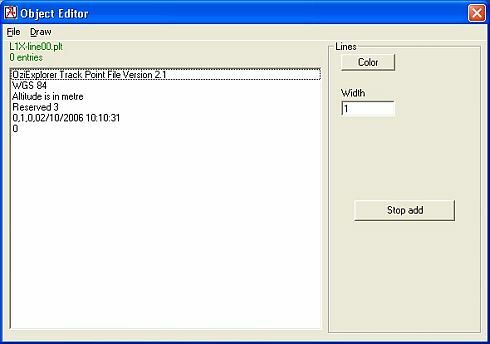 The Route data can be saved in a Text file by using 'Edit/Save data'. To find the Total linear Route length, a 'shift+right click' in the grey area will place the cursor at the Route end point, with the Odometer then giving the total Route length.